Twitter's live streaming app Periscope is now available to download for compatible devices from Google Play after previously being available only on iOS. Twitter bought Periscope earlier this year at a reported cost of $100 million, before relaunching the app for iOS on the App Store. It allows users to livestream to the public or to select users, and lets viewers interact with the broadcaster by sending them love (hearts) by tapping on their mobile screens. Now Android users can get in on the fun, but only if your device is running Android 4.4 KitKat or newer. The app is mostly the same as the iOS variant but there are a few noteable differences. For example, if a viewer is distracted by a phone call they have to take, then an alert will be put on the Android home screen after the call ends. Tapping the alert will return the viewer to the broadcast immediately. It also reportedly gives more control over app notifications than the iOS variant. Periscope has already been the subject of controversy as some users breached its terms and conditions by rebroadcasting HBO's Game of Thrones, and even the Manny Pacquiao vs. Floyd Mayweather Junior boxing event earlier this month. 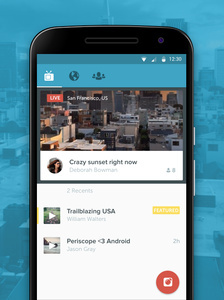 Periscope for Android is available from Google Play now.